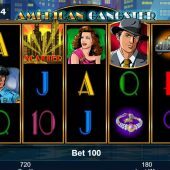 American Gangster slot is the second time Novomatic have made a foray into the dark side of Chicago after first releasing, well keeping it simple 'Chicago' although this one is more likely to remind you of Betsoft's The Slotfather and The Slotfather II games. Our reels are imposed over a high-rise cityscape and of course we get the standard Novo wheedle-and-trot sounds but at least a dramatic classical fanfare greets any wins that land. Will American Gangster be running a protection racket on our balance or can the forces of law and order see us safely through these mean streets? Like most Novomatic slots the game is pretty basic with no random in-play events and just the one bonus round but there are some decent hits (no pun intended) to be had in the base game. We get 25 paying lines over the 5 reels of 3 rows each and pay 25 coins per play. Our suavely dressed Gangster is the Wild appearing singly like all the other icons and paying 40x bet for a 5-of-a-kind win. 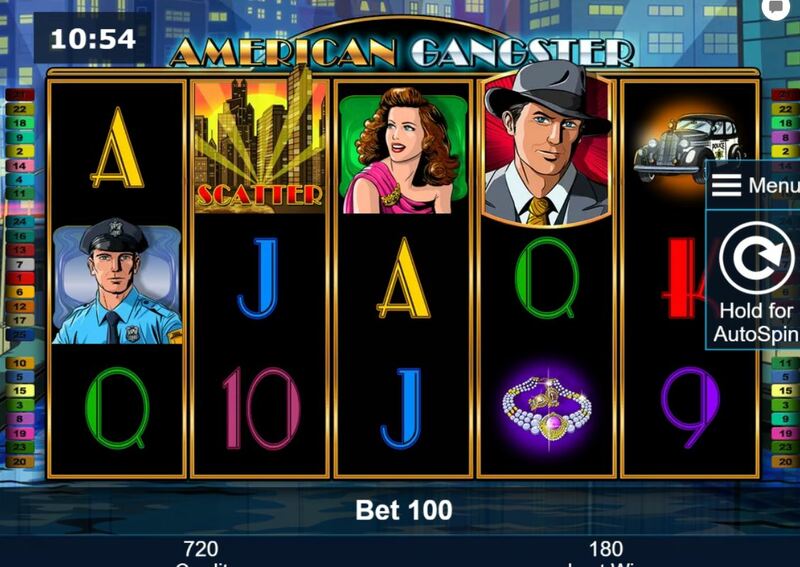 The Chicago skyline is the scatter paying 100x for all 5 but returning to the standard symbols we get 10x for the Cop and the Gangster's Moll, 8x for the Car, Loot and Jewellery with six card values all paying 4x for the full line. that's pretty much it, until we get to the interesting free games bonus! So having seen 3, 4 or 5 Chicago skyline scatters in view, you will be rewarded with 10,15 or 25 free games. You can retrigger them in the same way but you also get 5 extra spins for two scatters. During these spins all symbols on the last reel bar the scatter can randomly appear as 2x, 3x, 5x or 10x Wilds. this may not sound great being on reel 5 but in the game Wilds and 4-reel wins are quite frequent so you could hit 400x for a Wild line on the x10. Extra spins and retriggers are frequent too, another Novomatic trademark.